Over the years, other types of bicycling activity have influenced bike commuting. Mountain biking inspired the use of suspension on commuting bikes; racing bikes have introduced many new types of frame materials, such as carbon and alumninum. And bike messengers continue to inspire bike commuters. I know I love my custom Timbuk2 bag, even though I've never delivered a parcel. San Francisco's CETMAracks is a one-person operation run by working messenger Lane Kagay. The CETMArack is mounted over the front wheel, which is the stronger wheel and provides more stability. Recently Kagay agreed to answer some questions about his great product. Bike Commute Tips: How did you get started making racks? What inspired you? On your site, you feature images of vintage bike messengers and French newspaper couriers, who all carried weight on the front wheel. Where these an inspiration? Lane Kagay: You know what did it? I broke another good frame while carrying a 40-pound file box on a rear rack. I don’t know if your readers know this, but bike messengers earn more on large and heavy freight deliveries, so the bigger, the better. So of course the frame broke at the rear dropout. A few nights later I was at the bar talking to a guy about racks and freight transport. He got me hooked on the idea of making a front rack. I don’t think I’d seen the French couriers yet. So I had a small metal shop at home, and a few days later I made a front rack. I built it to be absolutely indestructible with multiple mounting holes so I could use it on different bikes. Drilled some holes for bungee cords and clear coated it. The notion that other people might want to buy these never occurred to me. For years, messengers have been cutting their baskets down to work as a flatbed. They cut away the front and sides to leave only the back and bottom part, so what’s left is an L-shaped platform. It eliminates unnecessary metal, and works better with over-sized boxes, which don’t always fit into a basket. I liked that. So this too, was a big influence. Bike Commute Tips: Why hasn't any major bike manufacturer created a broad front rack similar to yours. I know Jandd and Blackburn make racks that can be used on the front, and Wald and others make front baskets. But why no platform rack for the front? Do you think they have concerns about liability? Or do they just think there isn't a market for durable freight racks? Kagay: I really don’t know! It seems like most of those racks are made for “light commuting and across-town jaunts,” and never for grocery shopping or carrying firewood, or kitty litter, or gallons of water or books or whatever. You know, utility. I want a BIG platform that I KNOW can handle heavy stuff, and I want it in front of me where I can keep an eye on it and know the frame isn’t going to break or the wheel won’t be destroyed. The racks I’ve seen don’t provide any of that. The baskets I’ve tried always seem top-heavy with way too much extra metal there. And what happens when you need to carry something too big for the basket? A flat-bed rack is way more versatile and a perfect alternative. For me, at least. Maybe there isn’t a big enough market for them. I don’t know. Bikes are mostly used for commuting and recreation, not work and utility. But maybe that’s changing. High gas prices, choked freeways, urban sprawl, and good ‘ole global warming seem to have more people considering alternatives to the car. Also, I think movies like Fast Food Nation and recent media focus on “Fat America” have folks thinking about getting some exercise. 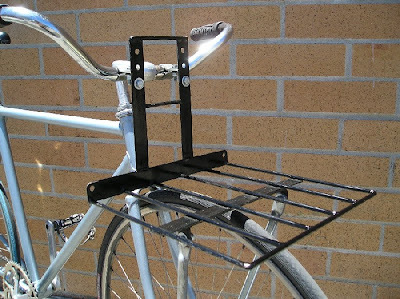 Bike Commute Tips: From your site, it seems the working messenger was the initial target market for your racks. Is that still the case? Are messengers still your primary market? My site is mostly for commuting cyclists. Do you think the CETMA rack works well for commuting? How would you compare it to the alternatives, such as a rear rack. Kagay: Initially, I didn’t market to anyone. Other messengers came to me wanting them, so that’s who got ‘em. But that quickly changed. Now I sell equally to the commuter crowd. My wife uses hers for shopping. She has a cardboard box that bungees to the rack, like a removable basket. She loves it. But for messengers that need to carry fileboxes and heavy freight, a CETMArack is indispensable. Bike Commute Tips: How did you get started with metal fabrication? Where did you learn your metallurgy? How did you select steel, rather than aluminum (or titanium)? Kagay: I started welding and metal work over ten years ago. I took a class, learned the basics, and got a job welding in the Los Angeles area. I did that off and on for about four years, and always had metal projects going at home. Steel is inexpensive, somewhat flexible, and easy to work with. Other metals just aren’t as practical for this sort of thing. Bike Commute Tips: Are all of your sales from your website and select stores? Have you been approached by any distributors? Are most of your sales to cyclists in California, or all over? Kagay: All my sales are through the CETMAracks website, a few stores around the US, and people on the street. I don’t have distributors. From early on, I began getting emails from people around the US wanting CETMAracks. I don’t know how they heard of them, but since then, I’ve sent racks to people in nearly every state in the country, and someone in the UK bought one last week. Bike Commute Tips: You feature some photos of interesting loads carried by cyclists using your racks. Do you have a favorite story about a load carried by a CETMA rack? Kagay: I’ve heard a few stories of guys carrying their girlfriends on their CETMAracks! One guy here in SF carries his daughter around on his. A friend of mine loaded his CETMArack up with a car battery, stereo system, and speakers, and sent me a pretty cool picture of the whole setup. A guy in Oakland uses his for transporting CO2 cylinders. I wouldn’t recommend it, but hey. A few months back I was sent to pick up “a few” large padded envelopes to be delivered around downtown. When I got there to pick them up, it turned out there were no less than fifty of them. So I piled as many as possible on the rack, and the remainder went into my bag. There’s a picture of the huge stack on the CETMAracks website. Aside from that, I can’t tell you how many times I’ve been able to carry two stacked fileboxes on my rack when the original messenger sent to do the job couldn’t handle it. Or how many times I’ve heard messengers tell me that the rack paid for itself within the first day, because they were now able to do high-paying freight deliveries. Great racks, Lane, thanks for talking to Paul. Get a photo of a dog sitting on one of your racks and you'll sell 10,000 in Portland. City Bikes Coop is the best bike shop here. Any plans to manufacture the woodslat rack? They look like good racks, and you can even barbeque on them! Good interview. I paid for a 5 rail and 2 light mounts on Nov 23, 2009 through Lane Kagay's google account and I have never heard from him since. He has never replied to any emails or returned any of my phone messages. All I'm asking for is a refund since I have never received the rack or light mounts. Tax break for Virginia bike commuters? "Sharrow": Appearing Soon on a Street Near You? Mandatory helmets in Salt Lake City? "Share the road" means what, exactly?